Industrial valves are vital to process industries and manufacturing plants. Regulating the flow of liquids, gases or fluidized solids, these devices keep the plant functioning safely. However, the rising demand and competition in the market has forced valve manufacturers to come up with new innovative designs that are efficient as well as require less fabrication costs and development time. This necessitates the valve design and development team to make use of right technology tools that are available today, so that customer requirements can be met on time and within the budget. Preceding the physical tests with simulation tools like CFD can be of a great help in designing efficient valves for specific applications. With tools like ANSYS Fluent, valve designs can be validated virtually, by re-creating the real world conditions through simulations. ANSYS Fluent has the capability to simulate external as well as internal fluid flow. For designing valves, flow simulation can help in identifying the design errors by visualizing the fluid flow patterns and other physical properties like temperature and pressure. 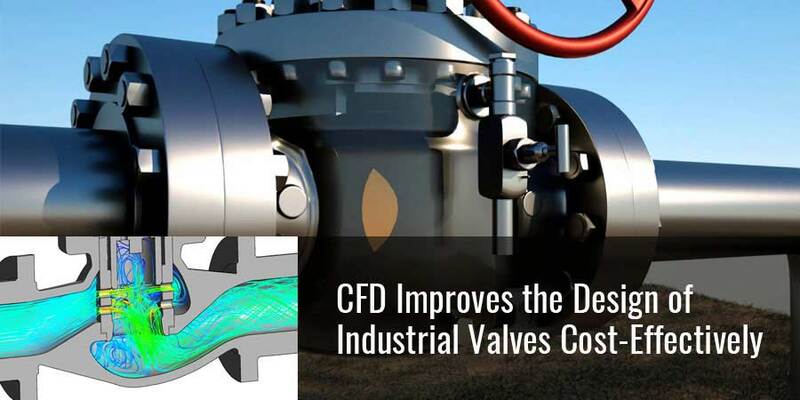 Critical design factors such as back pressure, pressure drop, Cv calculation, cavitation effect as well as valve efficiency can be easily determined through CFD analysis. Moreover, it is possible for the valve design engineer to evaluate the design under different operating conditions, to test the quality and safety. By simply changing the boundary conditions like pressure, temperature, velocities, mass and inlet and outlet conditions, multiple analyses can be performed to compare the performance of the valve. With post-processing, the user can visualize the effects of flow clearly using color differentiation. However, the major advantage of CFD analysis for industrial valves is the ability to reduce prototyping trials. Rather than performing multiple physical experiments to test the valve performance, changes in the design can be done on the virtual model and the optimum results obtained can then be compared with one single physical test.This not only shrinks the development time but also saves the cost involved in experimental investigations. Being a design support partner to industrial equipment manufacturers globally, Hi-Tech has developed extensive experience in performing virtual tests using simulation tools like CFD and FEA. Our simulation experts have helped manufacturers and design engineers to remain productive and also assisted in improving the performance of their products cost-effectively.Are you a valve manufacturer or a design engineer looking for a CFD partner to validate or improve your valve design? Reach out to us at info@hitechcae.com or know more about our capabilities at www.hitechcae.com.